Do you remember my Shower Shuffle quilt? (LQ#122) I made 16 different blocks using half square triangle units. And this block was my favorite block. So when the Fat Quarter Shop promoted their free pattern, Star Cakes, made entirely out of my favorite block, I added that pattern to my To Do list while I waited for the perfect fabric. 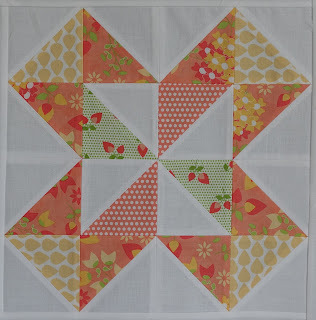 I used Sundrops by Corey Yoder of Coriander Quilts for Moda. I did add a few additional prints from my stash. I love Sundrops, the colors and the prints. 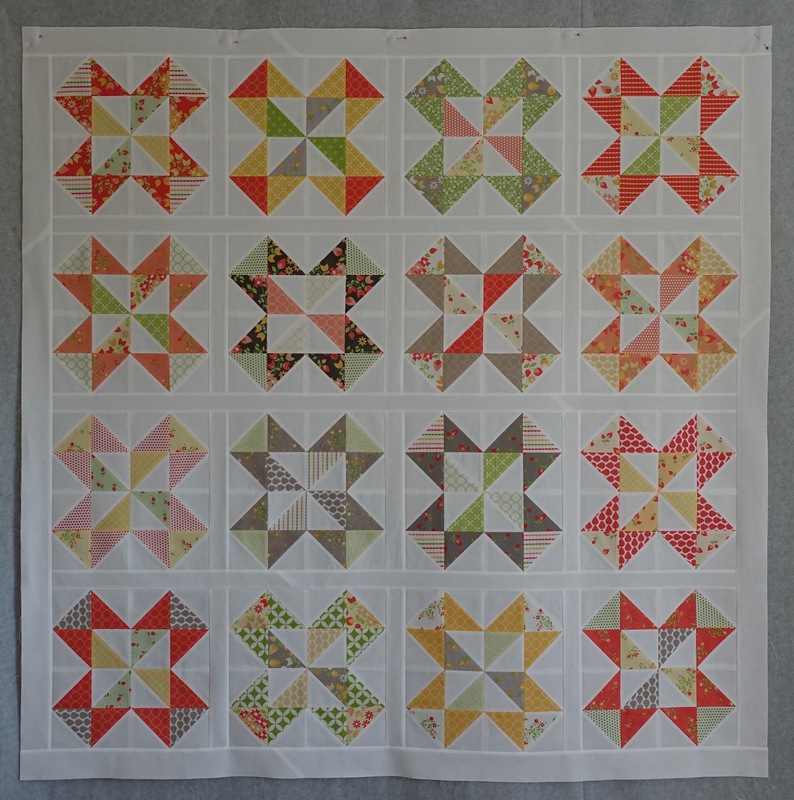 Corey has already posted a sneak peek of her next line called Lulu Lane and it looks very similar but with a couple new colors, I think the two families will make a great combo, I need to get more Sundrops, and so do you, before it's all gone! It should be in your favorite shop now. It finished at 57" x 57"
This quilt has approximately 531 pieces. 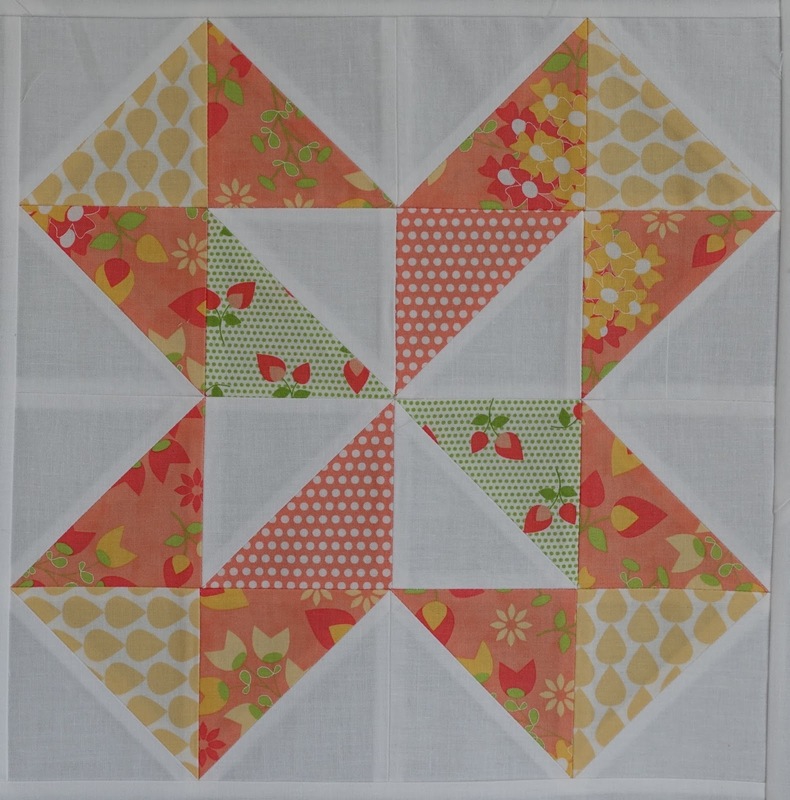 The pattern was very simple, the fabric nothing but fun, what a wonderful time I had making this quilt. Very nice, Thelma! Do you know how many times that I went back and looked at your Fireworks quilt?? It mesmerized me!!! Have a good day. Such a great quilt! Love the pattern and the fabrics! This is going to be a really great fabric and very hard to get soon as everyone is going to want lots. Love your blocks and now I am going to go look at me bag of half square triangles to see what I have....? So so pretty Thelma! Love it in Sundrops! Love the fabric line. The colors are so happy especially with the star cakes pattern. I love your quilt! I have loved this pattern since watching Kimberly Jolly's YouTube video. This fabric makes it sing. Beautifully done! What a great quilt - the fabrics looks so fresh and pretty!